Usually California ranchos began as Spanish or Mexican grants. But one in the San Ramon Valley came about a different way and it is sometimes called the Norris Rancho. This 4,451-acre parcel was the first successful land purchase by an American in the valley and was carved from the Amador rancho beginning in 1851. The Norris Rancho name is one example of the way people folded Spanish terms into life after statehood in 1850. The Spanish word “alcalde” is another. This combination of mayor and judge, was applied to Alamo’s Silas Stone, who was an older, highly respected man. “When Leo Norris came to the rancho in the autumn of 1850, he found a branch of the Soto family residing in an adobe house then standing about 150 yards from the site of his (eventual) residence. Apparently these were brothers of Rafaela Soto de Pacheco who planned to settle there, but they moved elsewhere when all their horses were stolen by Indians. “Leo Norris lived at Mission San Joe from June 1847 until the early autumn of 1850 when he and his son William migrated to the San Ramon Valley. With them went their cousin, William Lynch, a native of New York, who had landed in San Francisco on June 28, 1849, from the pilot boat W. A. Hackstaff. Lynch was a journeyman carpenter and practiced his trade in San Francisco before going out to the fertile valley of San Ramon, where he aided Norris in erecting his house, the first frame dwelling in the valley. Leo and Mary Jane Norris and family had immigrated to Alta California in 1846. That year other early San Ramon Valley included Joel Harlan and Minerva Fowler (who later married Joel) and Mary Ann and John M. Jones of Alamo. 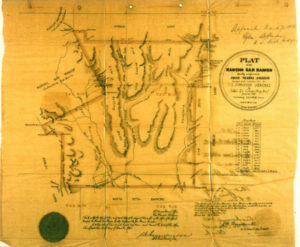 The Harlan and Glass families bought land from Norris in 1852 and 1859 while later immigrant Christian Wiedemann may have purchased Norris rancho land in the 1860s. Leo Norris recalled later that they arrived two weeks before Christmas of 1850, a few months after California statehood. At first, life on their ranch was similar to Mexican rancho life with a reliance on cattle grazing, later evolving to hay and grain cultivation. When American courts verified land ownership beginning in the 1850s, the Norris ranch included 4,451 acres (one square league) and Amador’s San Ramon Rancho included 16, 517 acres (four square leagues). The map which accompanied the court judgment (1862) shows the Norris Rancho in the northwest corner.